It draws well from the outset, with coffee and chocolate notes, a pinch of black pepper, but also a papery component. After an inch, it is picking up some nuts, wood, and a hint of sweetness on the finish. The papery note is hanging on, however, giving this a slightly dry character. The flavors develop nicely. At points the chocolate and nuts fade, allowing earth, wood and pepper to drive the train. Around halfway, I pick up a slight chemical note on the finish. It’s never overwhelming, but it rears its head intermittently through the second half of the smoke. Meanwhile, the draw and burn are excellent. I applied one touch-up to the burn line, though it would have been fine if I’d left it alone. Coffee grounds make a comeback toward the final third. It definitely held my interest down to the band. I characterize this as medium-full bodied, but definitely full-flavored. As many of you know, I’m a sucker for CTBL. Still, I have a hard time swallowing the Liga Privada No. 9’s $10 price tag when there are dozens of excellent CTBL-wrapped sticks out there at a fraction of the price. For example, the $3.35 El Sol Nicaraguan Maduro is comparable to the LP No. 9. Not as complex, but without the Liga’s downsides, either. For a contrasting view, the lovely and talented Lisa B. reviewed this one last month at Her Humidor. 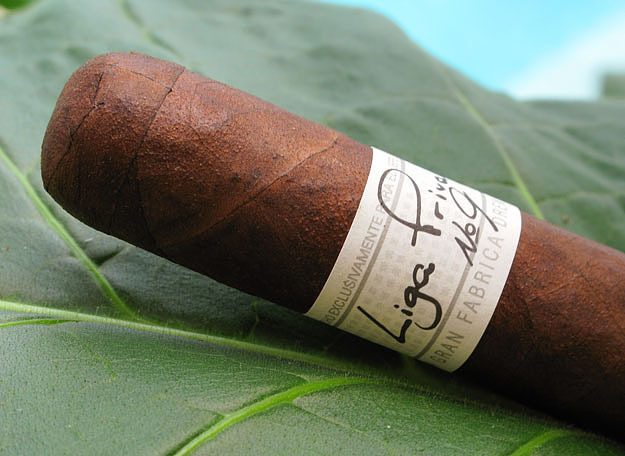 CONCLUSION: There is a lot to like about the Liga Privada No. 9. It’s a tasty maduro with impressive complexity. It covers the spectrum of classic maduro flavors — pepper, wood, coffee, chocolate, nuts, and earth balanced by sweetness. The construction is excellent. But this cigar’s flaws are inescapable. The dry, papery texture and fleeting chemical notes were distracting. And then there’s the exorbitant price. If you’re curious, as I was, try a couple of singles. A box, if you can find one, will set you back $250.00. As always, I am amazed at your incredible palate and photography skills. If anyone deserves to paid for doing this, it’s you. Thanks, Lisa, and it’s my pleasure. You’re doing great work. I’m just trying to keep up with the Joneses. And the Lisas!